Chickens are charming because they are innately curious, busy-body birds. They’re in constant motion, investigating new things (is this shiny droplet food? 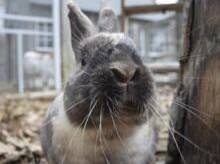 ), socializing, scratching, pecking, dozing, and chasing (each other and anything small that moves that might be edible.) Unless they are outside in a large and complex environment, they get bored. Boredom, as with all animals, leads to trouble. 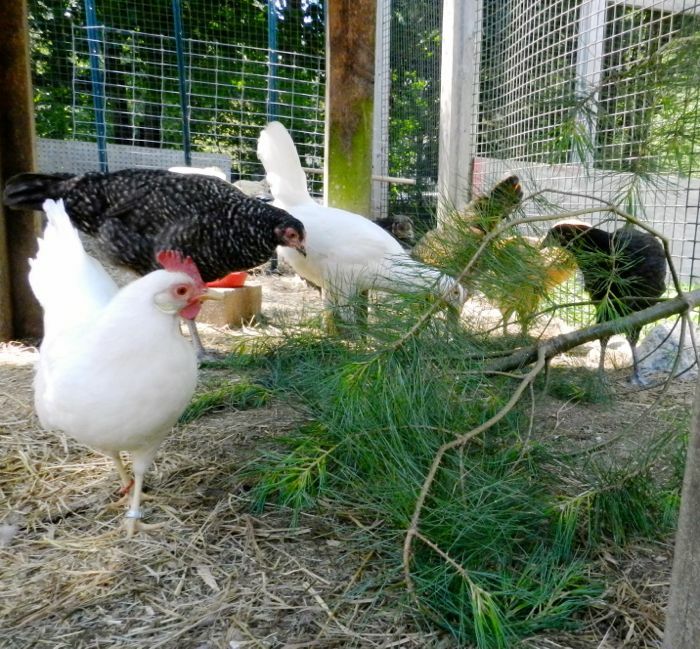 With chickens, that trouble leads to bad behaviors, like pecking each other, and pulling out feathers (their own and others). Chickens that would otherwise be high-status hens become bullies. Chickens that would otherwise be wallflowers are cornered and pounded on. When that happens, you end up with a flock that has more in common with its dinosaur ancestors than with the delightful farm animals that you’d imagined. 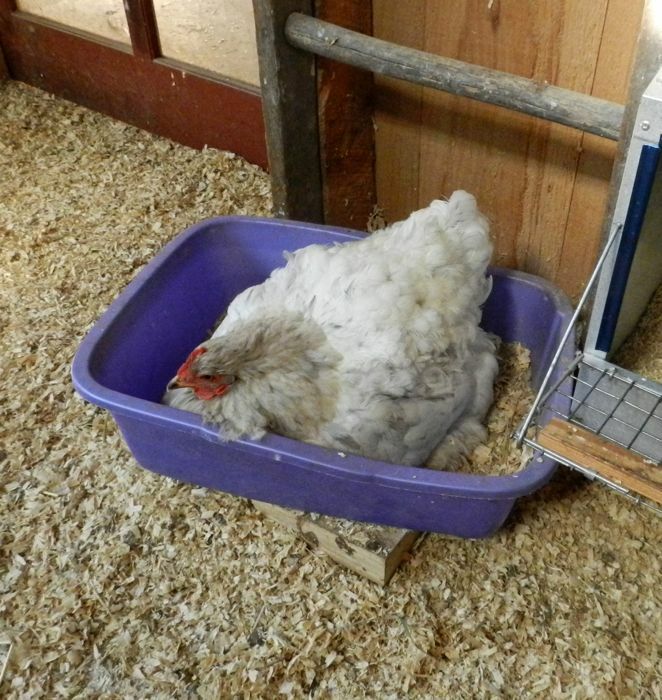 In many backyard situations, chickens are housed in a too-small confines, with a dirt yard and nothing to do. They’re fed treats, like cracked corn, that they fill up on quickly. This is bad for their systems, and they get fat, which leads to egg-laying issues and disease. Add boredom to the mix, and it can be a lethal situation. But, proper housing and management can alleviate all of these issues! 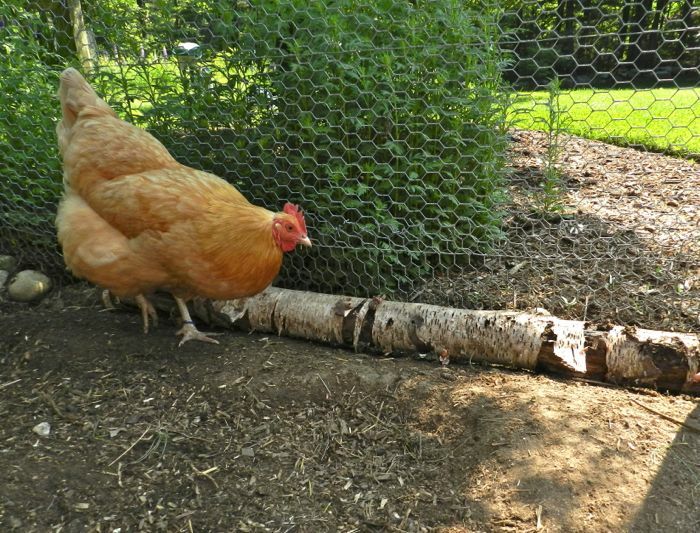 Assuming that you have enough space for your flock, (I’ve written about minimum coop and pen sizes here) what follows are ways to keep your hens from being bored. Uppermost in a chicken’s mind is eating. 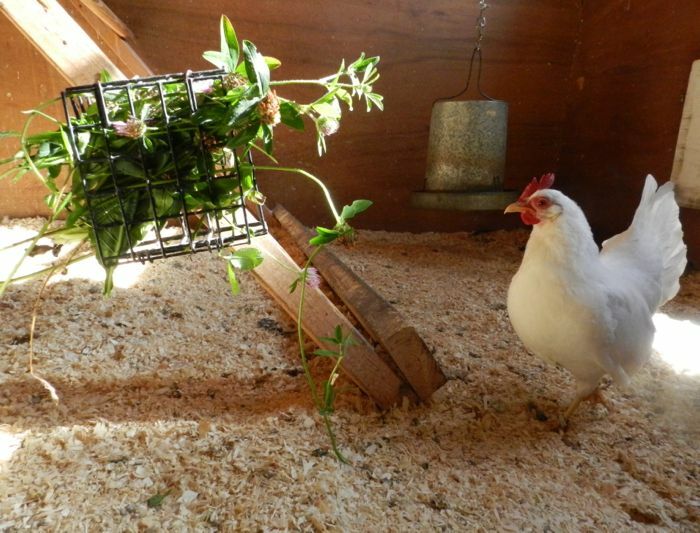 A hen is hard-wired to search for food by looking and scratching. 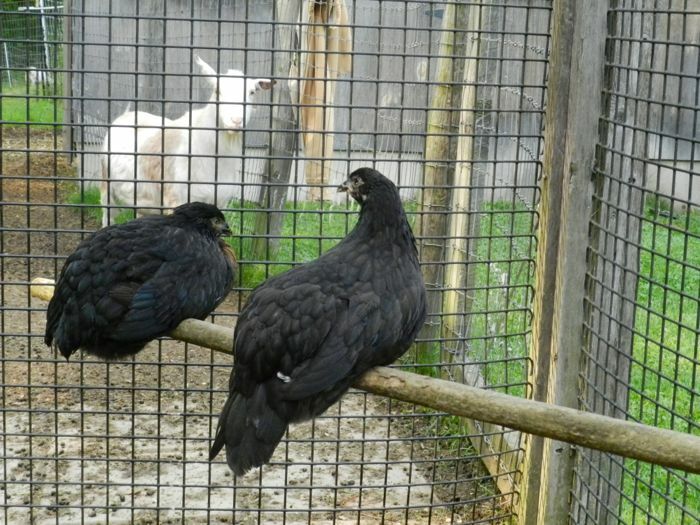 It’s not enough to provide pellets out of a feeder, as that need to hunt and peck will end up being focused on something else (like a hen at the bottom of the flock’s status or eating feathers.) Provide places to scratch and things to peck that will last hours, if not all day. Provide a decomposing log for them to peck at. Move it around once a week or so to expose the soft ground and bugs underneath. What keeps my hens the busiest is the compost pile inside of the chicken run. This photo shows a mess of green weeds that I’ve just put in there. The girls will pick out bugs, eat the greens and shred the rest. They’ll dig down and turn over the compost. It is an endlessly fascinating place for them. They’ll get good things to eat and stay busy, and I’ll get rich, loose dark dirt in a month. Provide something new for them to investigate. Simply putting in a pine branch will make their day. Dust baths are essential both for health and for the social life of the flock. The run should have a loose pile of dirt to get into. You have to give your flock things to do during inclement weather. Just like children can drive a parent crazy on a rainy day, so too, your chickens will need distractions when stuck indoors. A kitty litter box half-filled with sand and some food-grade DE will give them something to do. 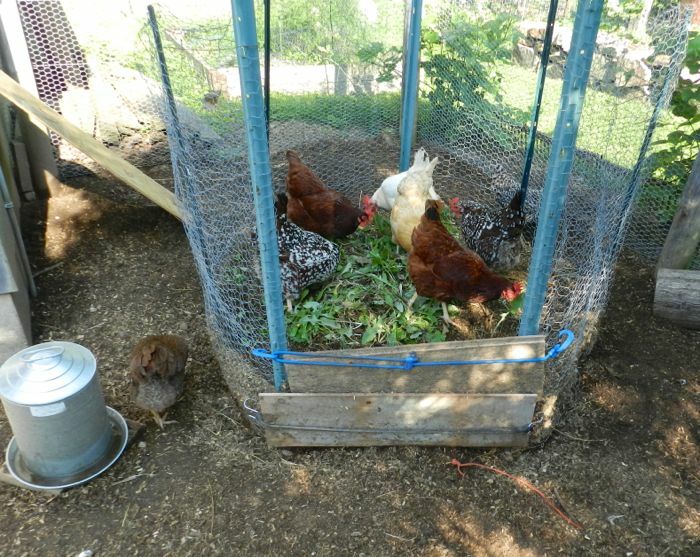 Greens tucked into a suet feeder will also keep the chickens out of trouble. And, of course, you can always set up a rousing game of cabbage tetherball. 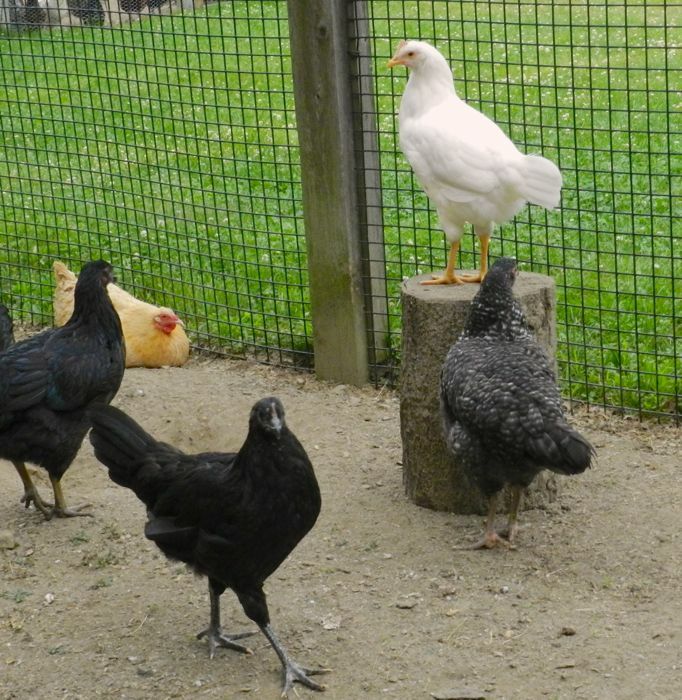 It doesn’t take much to engage your chickens in activities that will keep everyone happy – including you, because, really, being a spectator to the antics is part of the fun. Waiting for the day when you have Compost Cam. Great post. Thank you for sharing all the wonderful info. Years ago I planted bamboo in the middle of my run (fenced it off until it got established and still fenced) and I have a endless supply of bamboo limbs with yummy leaves. I simply cut and throw on the ground. A word of caution bamboo is extremely aggressive and will take over your entire yard. It spreads via runners hence why I planted it in the middle of the chicken yard, new sprouts get eaten. Brilliant way to control and invasive species. Just like horseradish spreads – but not if I let the goats get it! Great ideas! Thanks! I especially like the picture of Twiggy on her soapbox. 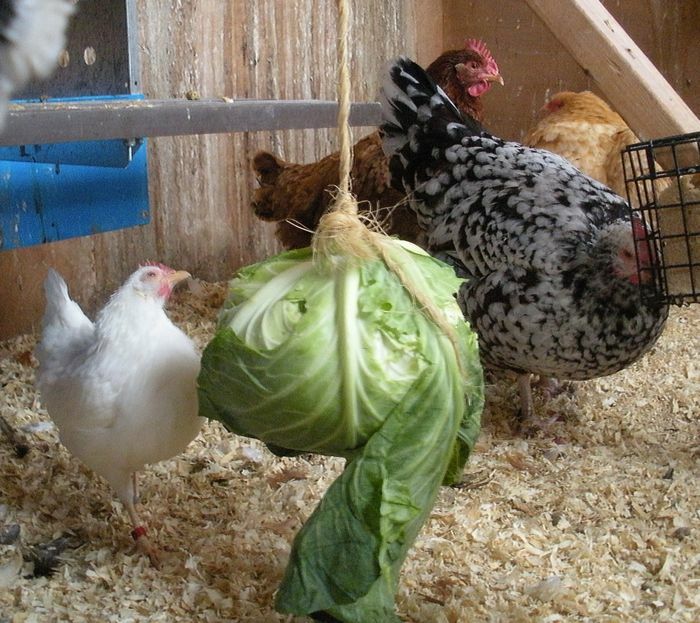 Terry, do you think my pullets would go for cabbage if it is hung up? I gave them half a head a week ago and I had to throw it out. Thanks for the post; I got right up and went out side for fresh grass for them!! Not all hens like the same things. Also, your young ones might prefer something easier and juicier. Have you tried cucumbers? Put on in the run, cut in half. After they figure it out, you can simply put a whole one out there. Love all this info and the great pics! Off topic: why are the roosts now separated so far apart in the Big Barn? Have the girls been tussling over position? Oops! I cleaned and forgot to put them back. Poor girls are probably quite confused! I love your little white hen, she’s gorgeous! Betsy was from a show breeder and she could have won ribbons. I’m sure you have the best-cared-for and most- loved -chickens in your whole area. They must thrive on all the care and attention you give them–goatie boys too!! Alas, the goaties are never satisfied with the scratches or the food. They always want more. When they are bored a peck at each other do they snap off the feather, leaving a stub so to speak? Feathers are very sturdy. They might be able to peck off the end of a feather. Or, they pull out the whole thing (remember Jasper’s tail?) but they rarely break. Just noticed Phoebe under the nesting boxes. Looks like she has moved in with the girls! Hutches, who needs them anyway? What with all of the rain, the mosquitos are terrible at night, so we let her stay in the coop. 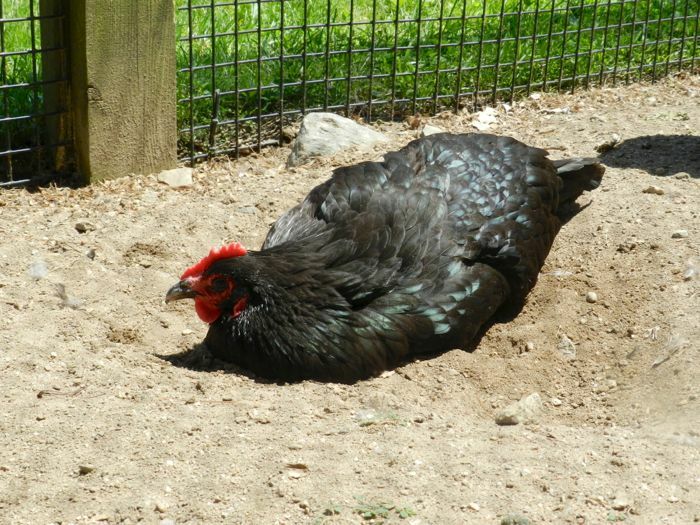 Phoebe seems quite happy reclining on the cool concrete beneath the nesting boxes (she’s even cleared off some of the shavings) while the pullets explore the hutch! A case of the grass is always greener? Terry, you’ll have to check the hutch once the pullets start laying! Thanks for all of these fabulous reminders and new ideas for keeping the flock happy. I have a question about freezing fruits before giving it to the hens especially in this hot weather we’re having. For example, if I freeze a half a melon and then put it out, would that help keep the girls cool? Is there any harm in doing that? (I know not to freeze leafy greens which just turn to mush upon thawing.) Thanks for any thoughts you might have! 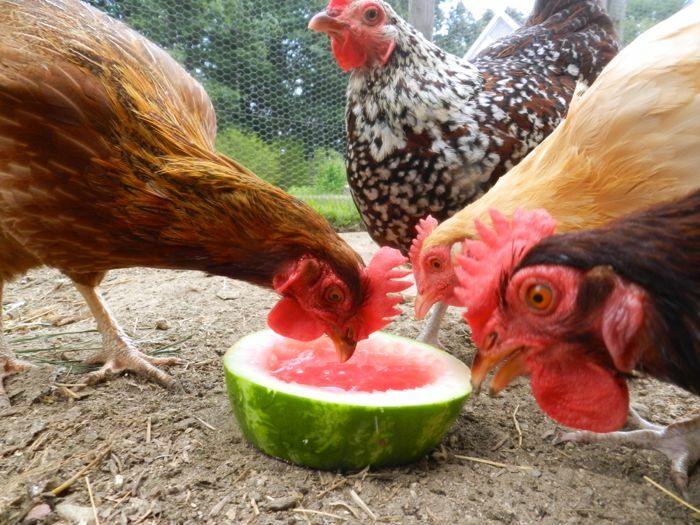 My chickens don’t mind mushy greens :) I’ve frozen watermelon chunks, thinking to use it later for smoothies, and instead fed it to the chickens. They were happy with it. I don’t think there’s harm in putting anything frozen out. BUT do make sure that whatever they don’t eat by the end of the day is raked up and tossed into the compost. Rotten, moldy food can make hens sick. Or, put the compost in the chicken run, like I do. I put all sorts of stuff in there that they don’t like, but they shred it and it becomes excellent dirt.